Product categories of Preformed Dead End Clamp, we are specialized manufacturers from China, Preformed Dead End Clamp, Preformed Dead End Tension Clamp suppliers/factory, wholesale high-quality products of High Strength Preformed Dead End Tension Clamp R & D and manufacturing, we have the perfect after-sales service and technical support. Look forward to your cooperation! 1. The preformed Strain Clamp is used to connect terminal support, tension support, splice support and support of angle greater than 25°. 2. Users according to the fiber cable diameter, RTS or span selection suitable the aluminium Coated Steel Preformed Strain Clamp . 3. 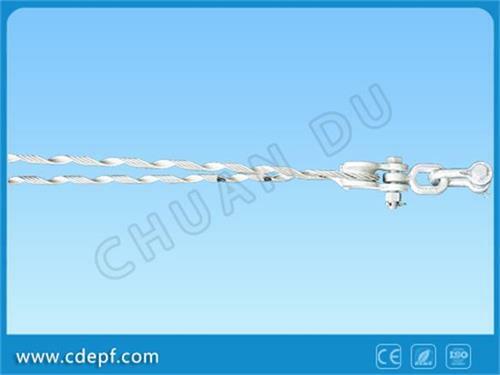 The Preformed Dead End Clamp for ADSS includes: Inner preformed armor rods, outer tension preformed rods, a Thimble Clevis, a clevis, two anchor shackles.